The appeal of a wormhole is its mystery: what will you find when you come out of the other end, if you come out at all? But Eve players have had wormholes for yonks, and nowadays publish guides about the best wormholes to live in. Yesterday’s Hyperion update is CCP’s attempt to inject a little of the unknown back into wormholes and their space game at large. This week, CCP have opened up new wormhole connections. Those with black holes inside have now become de facto fast-skirmish locations. 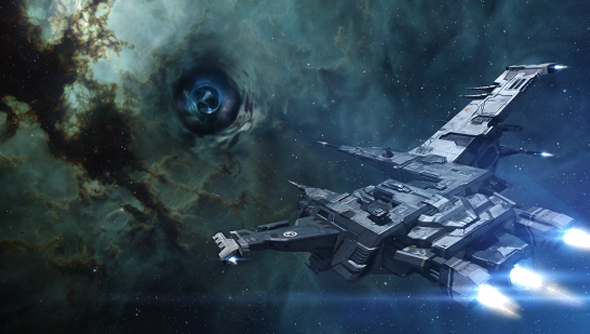 Class 4 wormhole systems have gained an extra reliable exit point – which will make them great forward bases for attacking other unknown systems. Changes to the mass calculations of ships entering wormholes, meanwhile, will lead to more “exciting skirmishes” – bigger ships will find themselves drifting further from relative safety at the hole’s entrance. Elsewhere, Hyperion’s plot has seen ‘burner’ pirates appear across the universe: solo criminals waiting behind space gates for frigate-class ships to open them. These fights were inspired by the emergent battles that happen between players, and are intended as alternatives to the high-level battleship warfare of existing agent missions. “Missions, wormhole exploration, and incursions are an integral part of EVE’s player-driven vicious cycle of harvesting, creation and destruction, with players of all levels sewing the fabric of our massive universe with their ambitions,” said Eve exec producer Andie Nordgren. Hyperion is CCP’s third mini-expansion to date. The Icelandic developers now plan to release around 10 every year. Have you found that cadence more agreeable than the occasional big-expansion splurge that preceded it?